George Nelson’s beloved designs are an icon of mid-century modern style. See how these famous silhouettes fit into modern spaces. Contemporary, rustic, commercial, ethereal—throw a dart at a thesaurus and you’ll find an apt description for the iconic George Nelson™ Bubble Lamps®. This beloved and recognizable collection has been a fixture in stylish interiors since the early 1950s, after prolific designer George Nelson was inspired by some silk-covered Swedish lamps, which were beautiful but expensive and tedious to produce. Popular designs can run the risk of becoming stale with overexposure, so how do you incorporate these famous silhouettes without falling victim to a cookie-cutter modern cliche? Well, with the Bubble Lamps®, it’s not that difficult. The perennially versatile designs offer endless choices and styling possibilities. A key design element is the group, and the Bubble series is ideally suited to this treatment. Because the lamps come in such a wide variety of shapes and sizes, it’s as simple as choosing your favorites and hanging them all up together. Here, the varying heights give a floating impression that is both sculptural and atmospheric. These shapes can also benefit from an organized layout, where the sum of its parts shines as a makeshift linear suspension over a long table. On their own, each Bubble lamp has its own aesthetic strengths to offer. New silhouettes and old favorites can stand alone or be combined into any configuration you can dream up. Nelson™ Bubble Lamps® even offers a Triple Bubble Lamp Frame for hanging three pendants (up to 19” in diameter) together. And many of the silhouettes come in varying sizes and types (like wall sconces, floor and table lamps) so they’re easy to incorporate into any existing decor. A more straightforward mid-century style complements a single Saucer Bubble Pendant, with all the smooth lines and light colors creating a relaxed, modern vibe. Organic shapes, gentle curves and a nature-inspired palette stand out here. A matching-but-not Cigar Bubble Wall Sconce lends a sense of coordination and flow to the open space. The look is fresh because nothing is perfectly matched, yet every component works together. Another grouping suited to a more intimate space, this corner shows that even a few Bubble lamps® can create quite a centerpiece. Whether lit or not, the sculpturally interesting white lights will become a focal point against the dark colored walls, and the effect is multiplied in the shiny finishes. 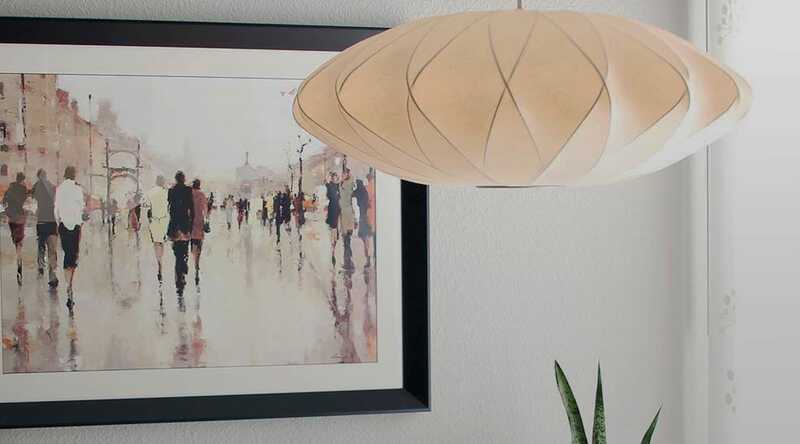 A low-hanging cluster of pendants like this in a living space could be hazardous, but the thoughtfully placed grouping prevents residents and visitors from walking right into the lights.